BLACK DOORS, y'all! I'm so thrilled to finally be tackling this one. It's been on my to-do list for centuries but it always falls to the back burner. But now that we've kind of reached a point where we can do the "little things" in this house, this one is up first. Our rooms have those awesome, cheapy, hollow-core doors that drive Carter bonkers. He likes his doors like he likes his women - solid. 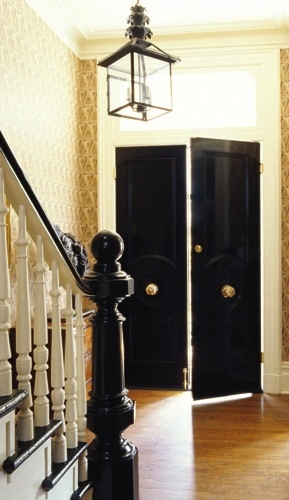 So we're starting downstairs by replacing the guest bedroom doors with sturdy, paneled situations and then they are getting a glossy coat of black paint. Followed by the bathroom, hall closet, basement, and front door! We then have three upstairs doors to tackle. The only doors that will escape the treatment are our french doors. I know it's going to be a small change that I will be kicking myself for not having done sooner. The mirror over your mantel is handsome, but it overpowers the room's colors and the sconces. Everything is soft and pretty, then the heavy pattern and black of the mirror strikes a heavy, discordant note. I like everything else, especially the pink painting. 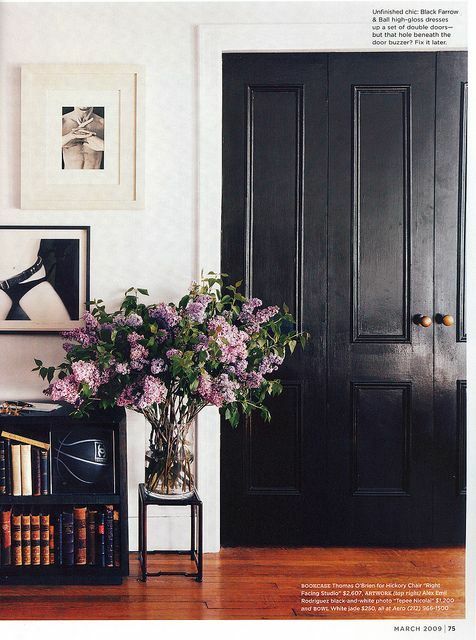 I love the look of black door, Daniela, stunning and elegant! 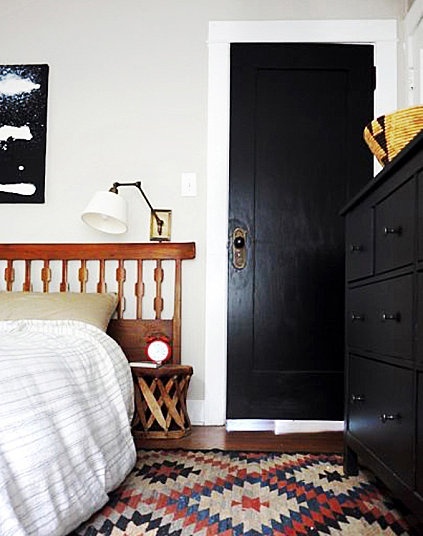 I love the black door look, too. Especially with brass hardware. My husband freaks every time I mention it to him. We live where we don't get much light a lot of the year. I would totally do it if we had a tract house or not nice doors. We just remodeled our entire house and it took almost 4 years! I have long admired your blog and your ideas. You are really good with decor. I adore your daughter's room. Keep up the good work! Love your black doors. They look great! Carter's doors = women. Best line ever. hahahaha I concur with Sheila. solid doors and solid women rock. our apt has basic wood doors that have mdf panels added to both sides. as a result they're heavy and block sound very well which is imp in NYC. if I had done them I would have used slabs o wood instead of the mdf but i think the original designer did it for cost cutting.